Delicate cleanser for hands and body. Its moisturizing and purifying properties counteract harmful effects of aging and of environmental factors. Performs a purifying and sanitizing/antiseptic action helping to restore the natural softness of the hands and body. The special formula of organic lavender essential oil is suitable for frequent washing and for all skin types. AQUA, COCO-GLUCOSIDE, SODIUM COCO-SULFATE, DISODIUM COCOAMPHODIACETATE, GLYCERIN, INULIN, BETAINE, OLEA EUROPAEA FRUIT OIL*, LAVANDULA HYBRIDA OIL*, GLYCERYL OLEATE, LACTIC ACID, SODIUM CHLORIDE, TETRASODIUM GLUTAMATE DIACETATE, SODIUM BENZOATE, POTASSIUM SORBATE, LINALOOL. Hydrating Complex: inulin (of plant origin), vegetable glycerin. 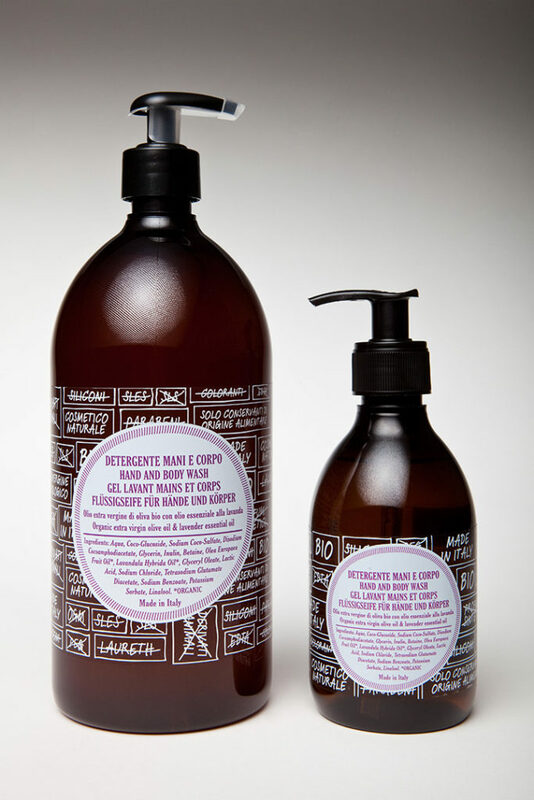 Purifying, Cleansing Complex: Organic lavender.